Would you like to open camera on Emerald Chat but you don’t know how to do it? You can find solutions on here and begin to talk to strangers with your webcam on the website. We are answering this question due to a question of our user on How to Chat Online. If you have also any questions, you can ask us through commenting the page or go to our support page. Click on “Allow” in the notification which asks you to use your camera and use your microphone. This is how you will open camera on Emerald Chat. Click on green “Secure” text which is located near of the web address. Ensure that Camera and Microphone are allowed. If they are blocked please change the option as “allow”. Finally you can enter the video chat now. If your camera is not working on Emerald Chat, this is a different issue. However before change your settings on your computer or in the website, we recommend you to do the steps above. Especially the second guideline can help you about the situation. 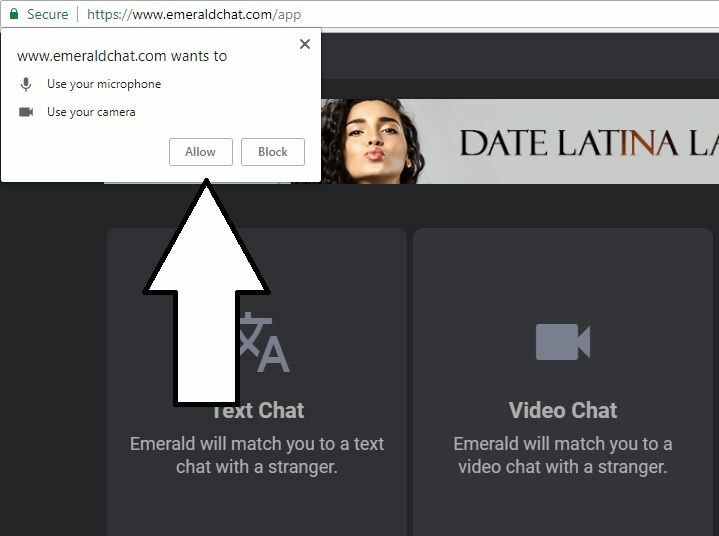 We have told you how to run your camera on Emerald Chat on this page. If you have also any other questions regarding Emerald Chat, you can ask us in our forums, free support opportunity or in comments in this page. We are going to provide more information about Emerald Chat at incoming days about text chat and video chat. Keep follow us!